This was the first year in which the first destination of Amma’s Bharat Yatra was Pune, and that too in the first week of the year!!! 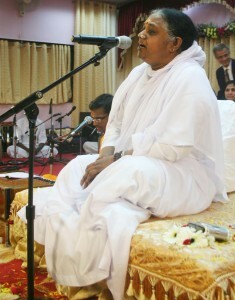 It was a sweet New Year gift for the devotees of Pune to be blessed with the physical presence of Amma. There were three programmes on 4th and 5th of January, in which thousands of Puneites visited the Ashram. A-VIEW, for schools, was launched in the presence of Amma, by Dr Arun Nigawekar, former UGC Chairman and Padmashri Vijay Bhatkar. Vidyamritam scholarships were given to 50 needy students and 50 women were enrolled for the pension scheme Amrita Nidhi. On the first day, around 25 students from Warkari Shikshan Sansthan in Alandi gave a devotional and rousing performance of Hari Path. Students from Amrita Vidyalayam too pitched in with good programmes on both days. 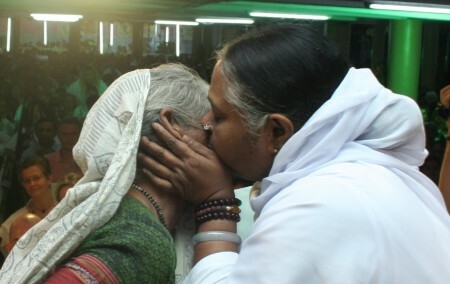 The programme, like every other, went on till the last person received Amma’s Darshan. As the programme was nearing to an end, and people started flocking near Amma, Amma sang a zappy Bhajan involving people around her by clapping with them and encouraged people to clap and sing, making it a fun-filled and joyous moment for everyone present. Hundreds of volunteers took part in the Seva activities, which included many students from Amrita Vidyalayam.